He had a collection of 150 military figurines but none of Singapore soldiers. 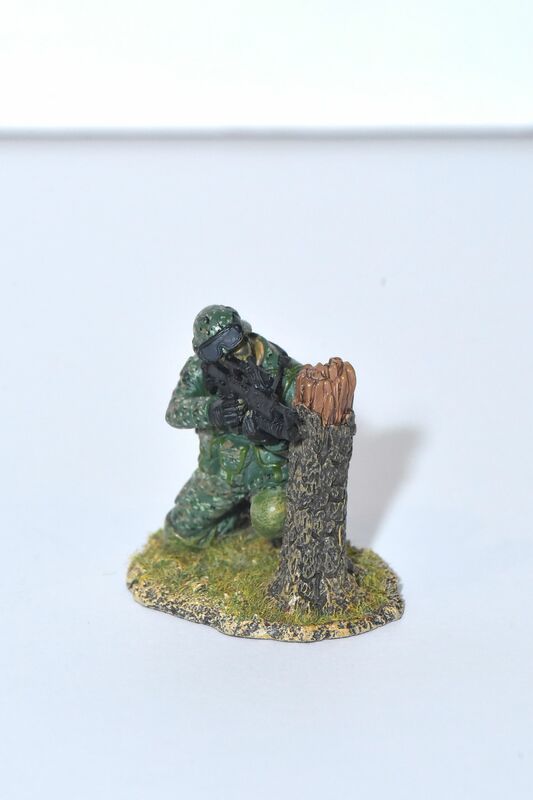 So Caleb Lin, a military buff, decided to produce his own miniature Singapore soldiers which he also sells online. Chaotic scenes of landmark battles from around the world take pride of place in Mr Caleb Lin's five-room HDB executive flat in Bukit Batok. Filling up a four-storey bookshelf in his living room are dioramas comprising miniature mediaeval knights seizing a castle in the famous Fall of Acre in Israel in 1291, sword-wielding samurais charging ahead in the Battle of Nagashino in 1575 and Nazi-Germany tanks from World World II. Over the past eight years, the 35-year-old, who works in the financial services sector, has amassed about 150 military-themed figurines spanning different periods and countries. However, one category of soldiers that resonated with him most was sorely missing - those from the Singapore Armed Forces (SAF). The self-confessed military geek realised that Singapore soldier figurines are unlikely to be featured extensively by overseas figurine manufacturers due to the relatively small market here. 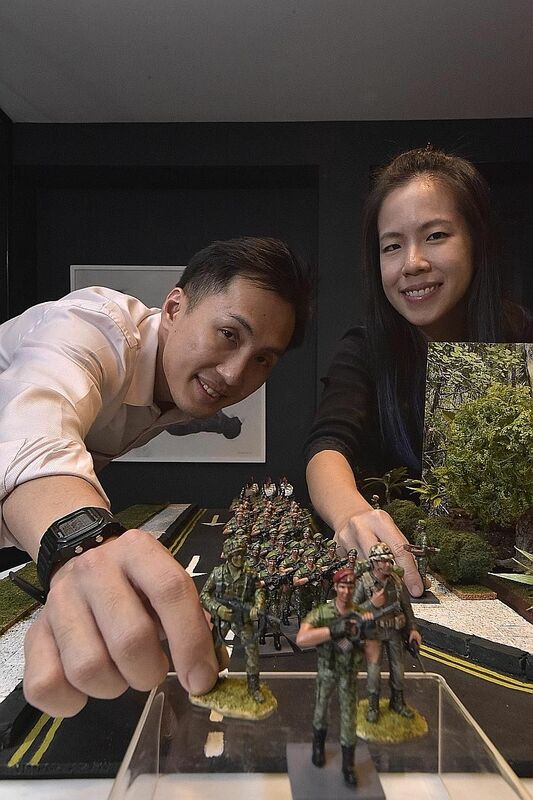 In September last year, he teamed up with his wife, Ms Terra Chua, 35, to launch Miniature Stories, a line of SAF soldier figurines and collectibles. Mr Lin says: "As a collector, I want to cover soldiers from every era of conflict in the world. Our men deserve to have a place in the world of miniature toy soldiers, standing next to hoplites and samurais." The low-rope standard obstacle course figurine brings back memories of my struggling to complete this station. These figurines would make it easier to share what I have been through with my grandchildren in the future. What: Baby boomers who did their national service in the 1960s and 1970s would have donned the Temasek Green uniform, held a self-loading rifle and strapped on a skeletal battle order (SBO) - a belt consisting of ammunition pouches, a water bottle, toggle rope and bayonet. What: A second-generation soldier wears the classic Woodland Camouflage pattern uniform that was used from the 1980s to the early 2000s. Armed with an M16 rifle, he is in a standing-hip firing position, which has been adopted as the symbol for open mobilisation exercises that flashes on television screens. He is also wearing an SBO that is equipped with a toggle rope, comms cord holder, L-Torch and whistle pouch. What: Taking cover behind a tree trunk, a third-generation soldier, wearing the pixellated "digital camouflage" uniform that was introduced in 2008, prepares to fire with a SAR 21 rifle that is attached to an M203 grenade launcher. In full camouflage get-up, he is also wearing a load-bearing vest that is strapped on with ammunition pouches and a water bottle. He has on a pair of goggles and knee guards. What: Adopting a firing position, another third-generation soldier has a Matador anti-armour weapon system perched on his shoulders as he prepares to shoot an enemy vehicle. In full camouflage get-up, he also has a SAR 21 rifle slung across his shoulders and wears a load-bearing vest with ammunition pouches. What: A third-generation soldier is on the verge of conquering the low-rope station in the Standard Obstacle Course. To hoist himself up, he needs to use his right leg to loop the rope over his left leg and pull upwards until he taps on the metal bar. He is also carrying a SAR 21 rifle and wearing a load-bearing vest with ammunition pouches. Miniature Stories comprises 18 designs of SAF soldiers in three categories - parade, assault infantry section and the standard obstacle course. Each hand- painted metal figurine is 6cm tall. In the parade series, the SAR 21 rifle-trotting soldiers don different berets and feature three races - Chinese, Malay and Indian - coupled with stern-looking regimental sergeant majors yelling out commands. 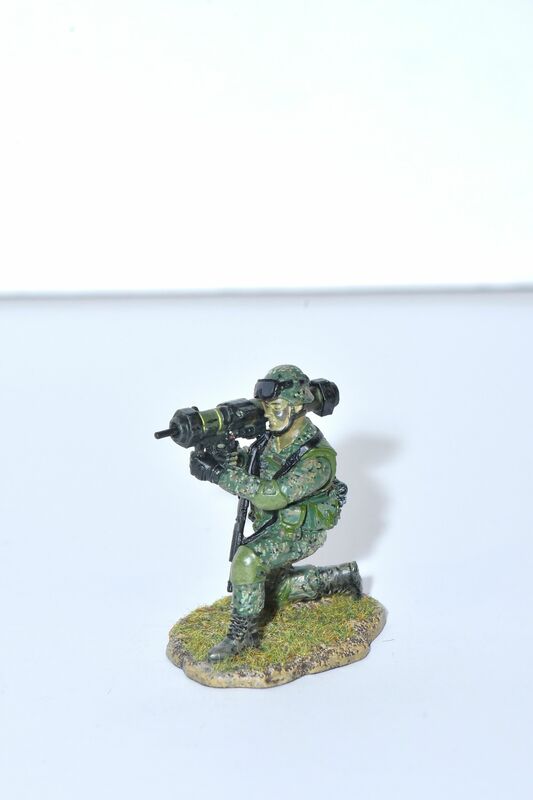 The assault series captures a section of seven soldiers in camouflage get-up, using weapons such as a Matador anti-armour weapon system. 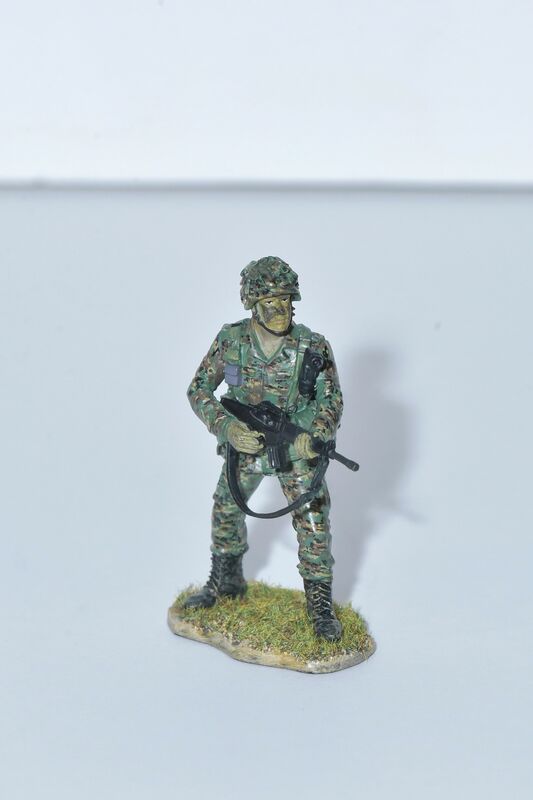 Figurines can be customised by adding formation and skill badges to the uniforms. 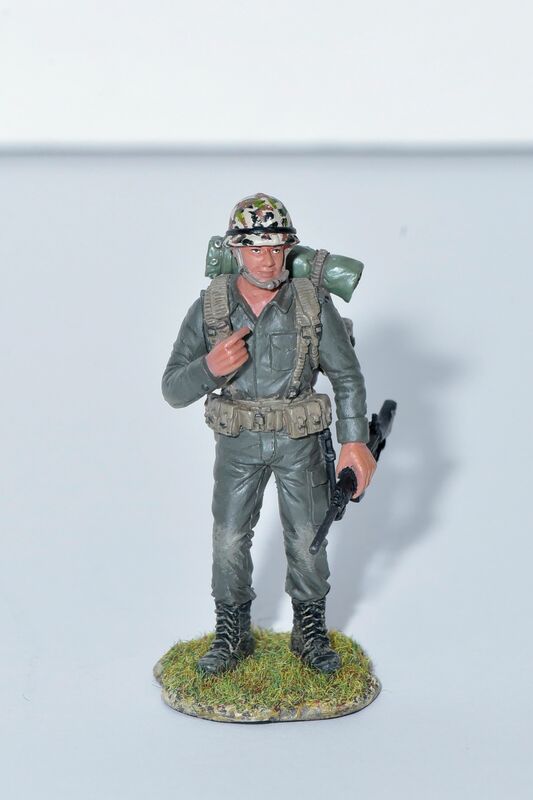 Besides third-generation soldier figurines, there is also a first-generation one in the classic Temasek Green uniform that was worn in the 1960s and 1970s, and a second- generation soldier armed with an M16 rifle. The first-generation one was introduced in April to coincide with NS50, a year-long celebration to commemorate 50 years of national service this year. 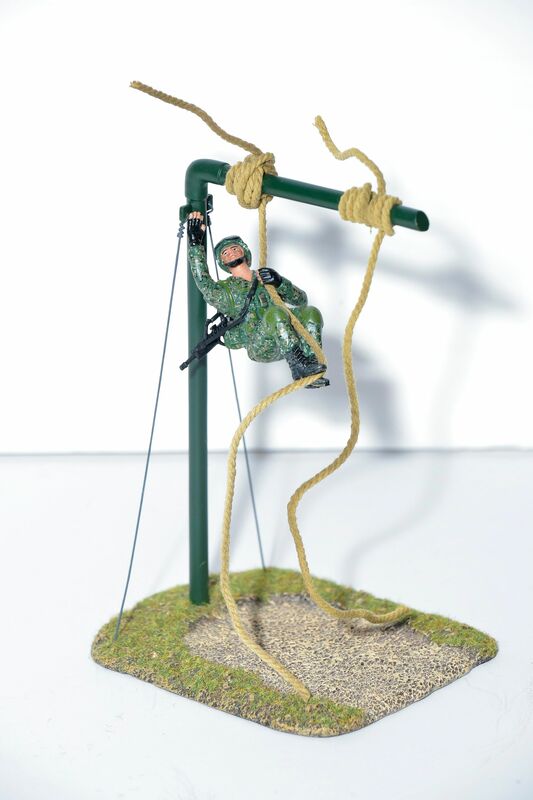 Finally, for the standard obstacle course series, the figurines depict three stations, such as scaling a low wall and doing the low rope, in which a soldier hoists himself up on a rope. The figurines range from $59 to $75 each and can be bought online (miniature-stories.com). Mr Lin believes that these figurines strike a chord with Singaporeans who have forged a special camaraderie through national service. "Looking at these figurines brings back good memories of training and cheong sua-ing during outfield camps," says the former third sergeant in the armour infantry unit. Cheong sua is Hokkien army lingo for undergoing rigorous training. "Whether they like it or not, most guys have memories of wearing the army uniform and using weapons, and whenever army buddies meet, sharing stories of going through the training never gets old," he says. The couple pumped "a low six-figure sum" into the venture. Each figurine takes four months to produce. The design process starts with e-mailing photos and magazine cut-outs of military gear to a China-based toy manufacturer, which specialises in making military figurines. The couple also turned to war movies to capture the actions of soldiers in the figurines. Mr Lin drew on his experience as a marksman by modelling for the clay prototypes to ensure that the posture of the soldiers and position of the weapon are accurate. Every detail, down to the skeletal battle order - a belt that comprises ammunition pouches and tools - is intricately carved in the figurines. About 300 to 400 figurines are produced in a batch. The toughest part was replicating the pixellated camouflage pattern in the current army uniform. Ms Chua says: "As there are no fixed designs to follow, the painters had to experiment with shades of green, brown and black and paint them dot by dot." Ms Chua, a former civil servant, manages Miniature Stories full time. The couple have no children. Business is gradually picking up with a successful run at the Army Open House in the F1 Pit Building two weeks ago. The couple have sold about 400 figurines since September last year. Ms Chua says most of the customers are men aged above 35, as they tend to reminisce after completing their reservist cycle. Taxi driver Eugene Foo, 39, who bought 10 figurines, says: "The low-rope standard obstacle course figurine brings back memories of my struggling to complete this station. These figurines would make it easier to share what I have been through with my grandchildren in the future." Army regular Sathya Pannisilvam, 26, received the entire assault series as a birthday present and says these figurines remind him of his stint as a section commander in the Guards formation. "Fighting an outfield mission with your men gives you the best memories in the army and these are captured through the good details of the weapons and uniform." Later this year, Miniature Stories will roll out more second-generation soldier figurines, including those depicting fun and informal scenes of "soldiers talking while cooking in outfield camps". Miniature armour vehicles such as the now-defunct AMX-13 SM1 Tanks that Mr Lin trained in are also in the pipeline. Beyond the army, the couple also intend to introduce miniature figurines depicting key milestones in Singapore's history, such as the broadcast of Singapore's independence from Malaysia in 1965 and old street scenes. Mr Lin says: "Singapore has come a long way to make its mark on the world stage. These figurines are a good way to celebrate our way of life."